Hello Scrappers! Jana Eubank here. When I think back to the winter days of my childhood, I fondly remember playing for what seemed like hours out in the snow. Now that I am a mom, I realize that I probably was only out there for about 20 minutes before I was ready to come back inside for a mug of hot cocoa. Ha! At least, that was the way it was when my own children were young. For today's page, I pulled out some older photos of my girls frolicking in the snow in our yard. The Freezin' Season collection complimented their brightly-colored snowsuits perfectly! 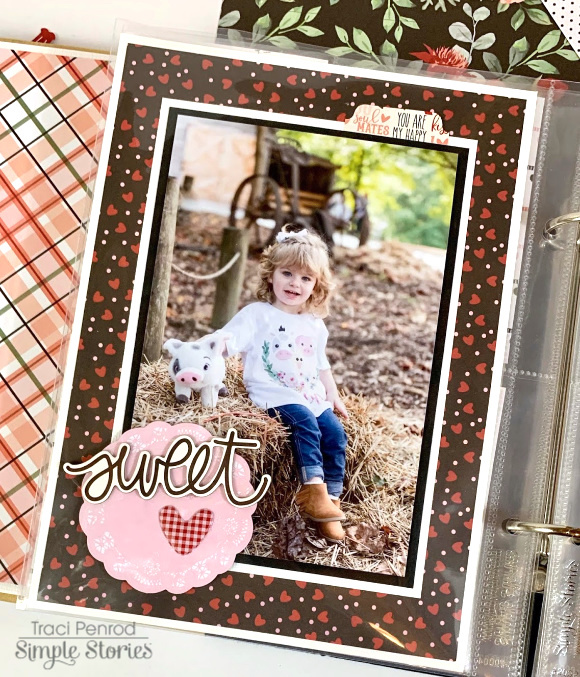 Even though my journaling for this page is a bit snarky, I assure my girls that I still love them "snow much" with this cute banner die cut from the Bits & Pieces pack. I stitched around the edges of the paper layers with black thread to tie them in with the black lines of the adorable hand drawn art in this collection. I love this chipboard snowglobe with it's cozy little house. Looking at the wisp of smoke coming from the chimney makes me think of the smell of chimney smoke outside on a cold winter day! I added the pair of snowmen, fussy-cut from one of the 4x4 Elements cards, to mimic my girls in the photo. I used the "SNOW" sticker word, combined with a word I created with my electronic die cutting machine for the title. I used large circle punches to create the journal spot and then accented it with pine trees cut from the 4x4 Elements cards and a pair of snowflake circle die cuts from the Bits & Pieces Pack. I am truly, madly, deeply in love with you. 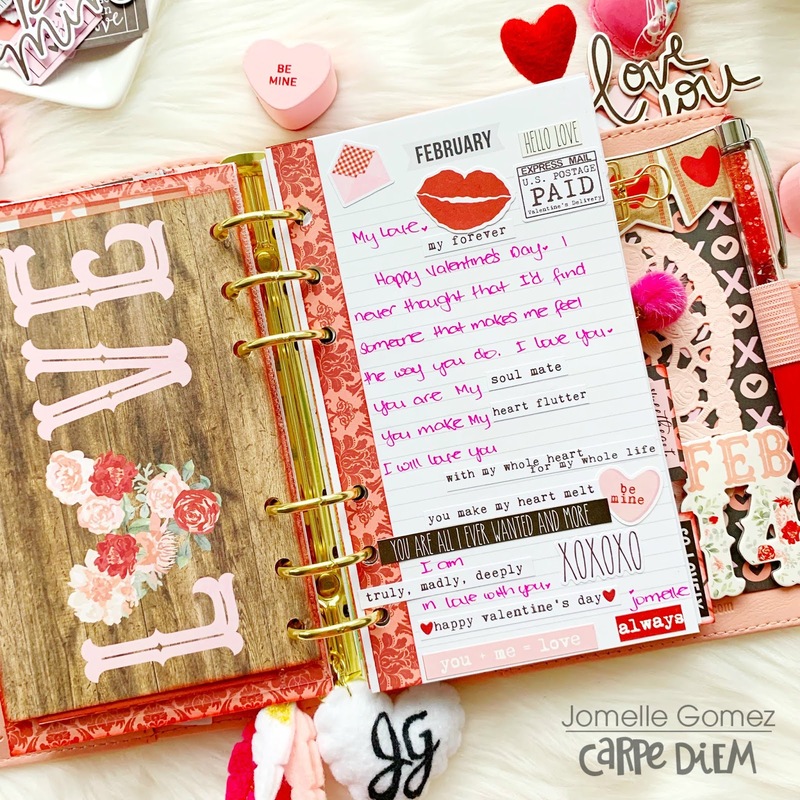 Today I am sharing how I used the Kissing Booth to set up my Blush Personal Planner. I can't believe I have forgotten how cute and very portable personal size planners can be, especially as my everyday carry. 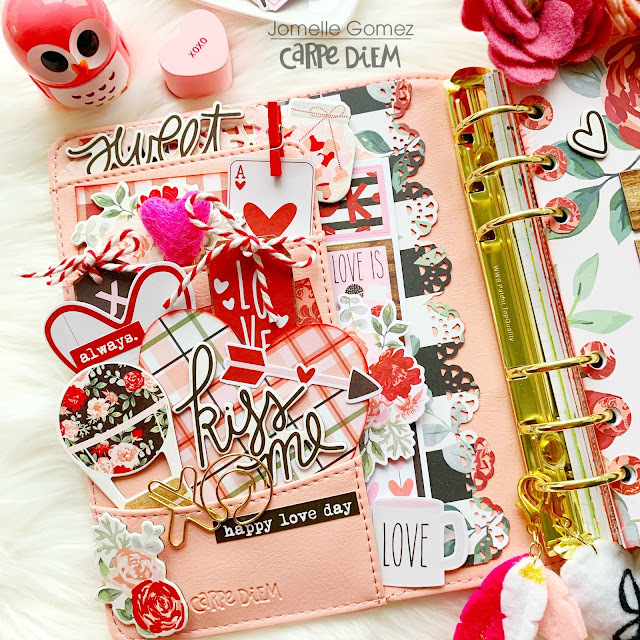 I added many bits & pieces of my heart into the planner to create my "Pocket Love"
I've also punched some hole reinforcers using one of the red 12x12 paper. It has a double purpose, one as reinforcer and the other is decorative. I love decorating my dashboard by layering different elements from this collection. I decided to use the "always be true" 12x12 paper with the light pink flower as my background. Then I added the scrabble pieces "LOVE" from the chipboard stickers. I added a light pink doily on the bottom right of the page and I finished it off with stickers. I made dividers using different pattern 12x12 paper. I used the personal divider template. I've decorate some of the dividers and some I left them plain. I also decorated one of the vertical pocket pages to add some layers in my set up. Happy Valentine's Day My Love. You are my everything today, always and forever. How are you spending your Valentine's Day? You can set up your planner using the Kissing Booth collection and jot down your plans or you can just have a set up all about love. Thank you for stopping by. It's the final day of our Spring AND Summer Release Reveal & today brings a brand new Carpe Diem release! From 3 gorgeous new A5 Planners, new Monthly Insert Sets, Sticker Tablets and FOUR new Spiral Planners - including Home and Budget! - you'll find everything you need to get & stay organized in a simple, yet beautiful way. Make sure to visit us on Facebook & Instagram for chances to WIN the new products before you can buy them! A5 Planners & Monthly Insert Sets will be availalbe later this month; Spiral Planners and coordinating sticker tablets shipping in May. 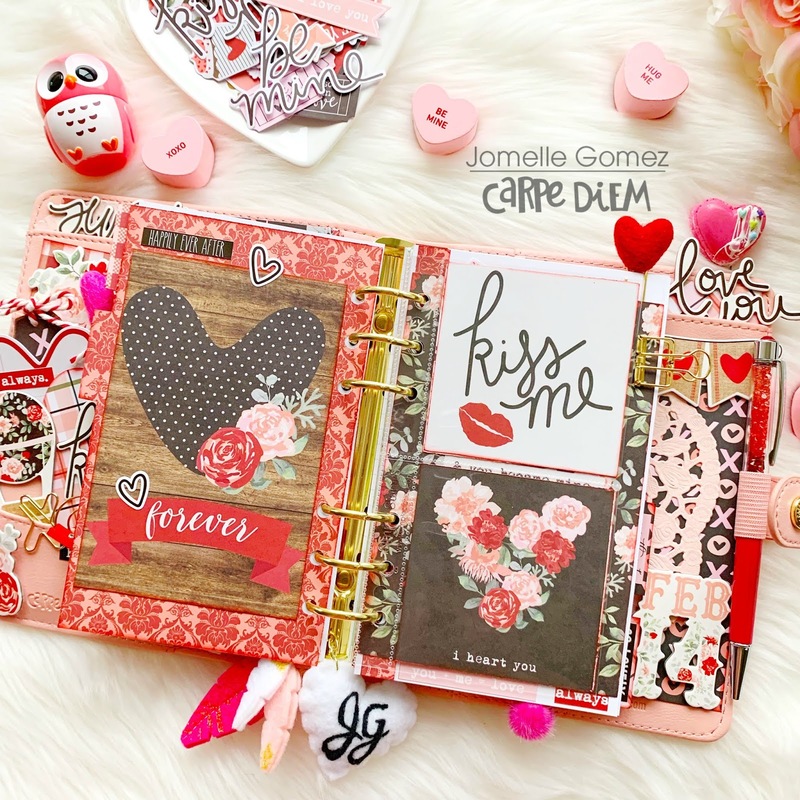 Head on over to the carpediemplanners.com and sign up for emails so you receive notice when these fun new products are available! Love You With Kissing Booth! Hello! 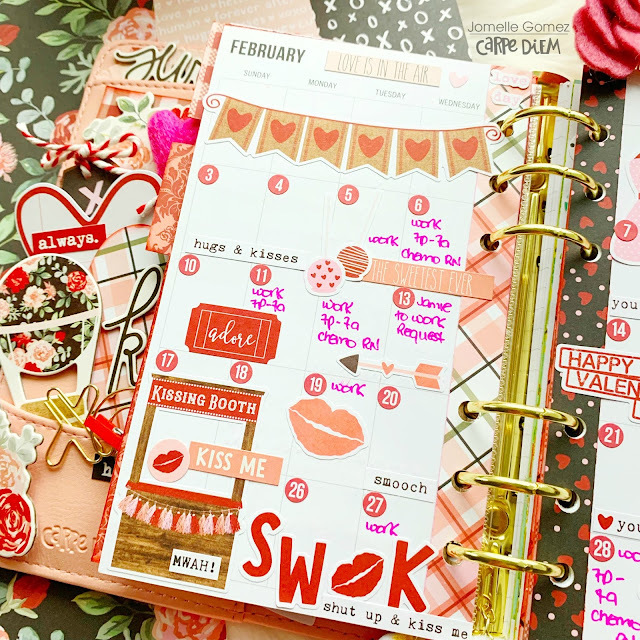 It's Jennifer on the blog today to share with you a layout I created using the fun Kissing Booth collection! Of course this line is geared towards Valentines Day, however it really can be used for just about any theme! For example, this photo of my daughter was taken this past summer! It's such a "girly" picture and there are so many great patterns in Kissing Booth! I almost always start with a plain background for my layouts so I began with a piece of kraft cardstock. Then using the beautiful floral print of "Love & Adore", I cut a heart die cut from my Silhouette (Flower Heart by Paige Evans #222462). For my title, I used the script "love you" from the 6x12 Chipboard. I really love the black/white color combination against the bold reds and pinks! I also added a floral cluster found on the Combo Sticker sheet which I popped up with foam tape! 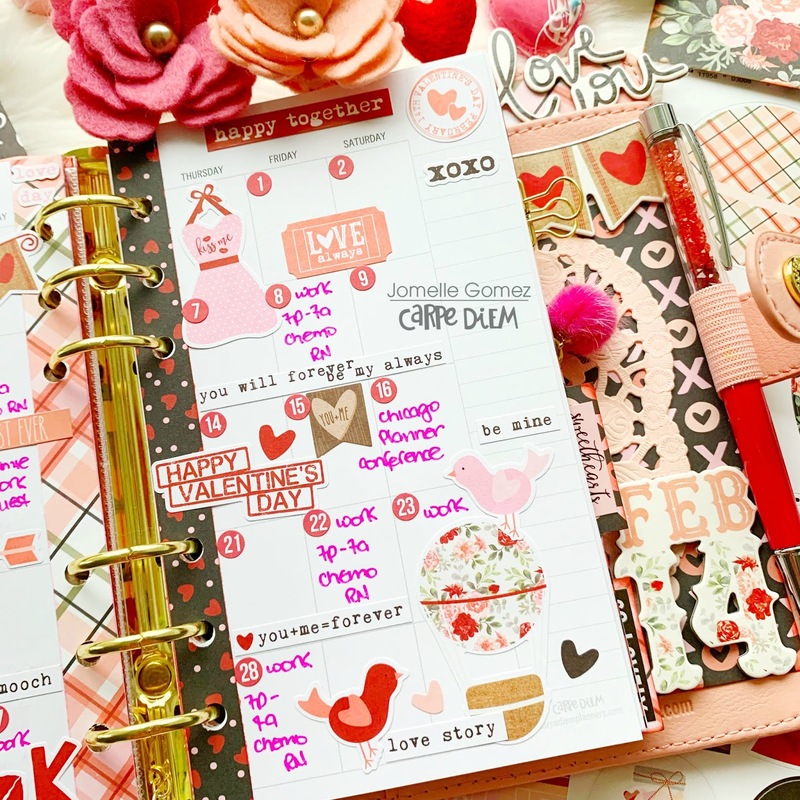 The Bits and Pieces pack never disappoints with cute journaling spots such as this fun heart shaped ledger print! The little flowers are a nice addition, too! I always love to add a couple sentiment stickers from the Combo Sticker sheet as well as one of the 4x6 Stickers! Here, you can see I added in additional patterns under some of the flowers by using my circle punch. I then finished the look with a bit of stitching with my sewing machine. Around the edges of my heart, I added smaller embellishments such as this floral cluster from the 6x12 Chipboard. 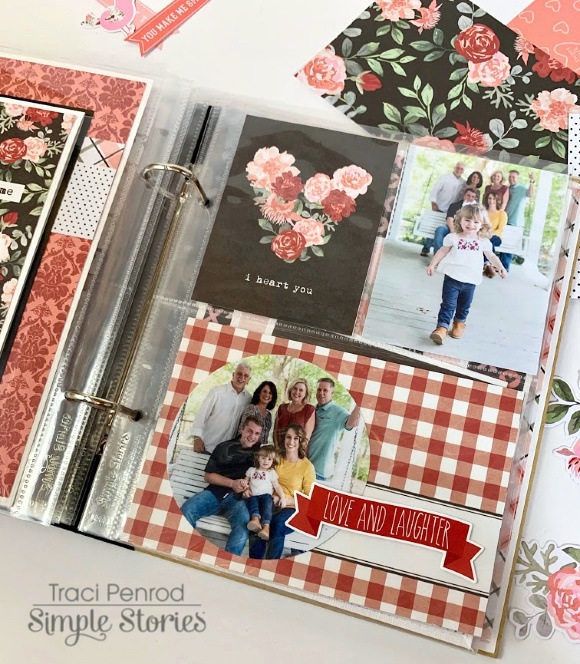 I also tied in the plaid pattern of "Crazy In Love" with this sticker tab tucked underneath the top of my photo (I adhered strips of the same paper at the top and bottom of my layout as well as in the center of some of the flowers of my die cut). The Kissing Booth collection also includes Puffy Stickers which make a fun accent! I love the tiny ones that look like candy hearts! I added a few around my layout to add extra dimension along with some paint splatters. Thank you for stopping by the blog today! Be sure to check out Simple Stories' social media sites for upcoming releases and giveaways! Have a great day! The 'Freezin' Season' paper collection by Simple Stories will definitely give you chills but in the best way! Adorable characters and wintery images in pretty pastel colors are just the cure for a snow day! This sweet zig zag mini scrapbook is just waiting to be filled with playful pictures and mementos of a winter wonderland! 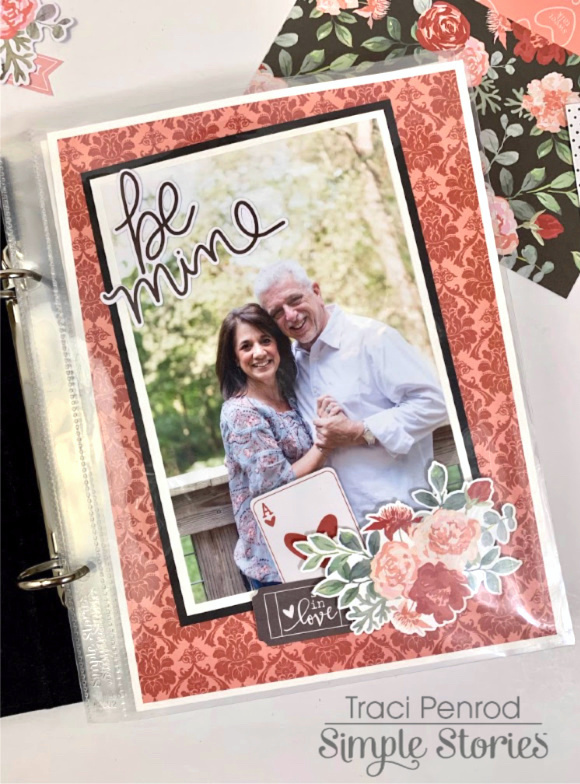 I made this album using two sheets of 8.5"x11' card stock and then covered each page with the delightful and charming patterned papers of the collection. I also used lots of the paper along with journaling cards to create oodles of pockets, flaps, tags and inserts that have been decorated and embellished with the darling and colorful stickers, chipboard and Bits & Pieces! And a closer look at the equally adorable back side pages! Don't let Winter get you down! Grab this collection to show the coldest season just how much fun it can be!! There is a short tutorial on my YouTube channel if you want to make one of these zig zag minis of your own! 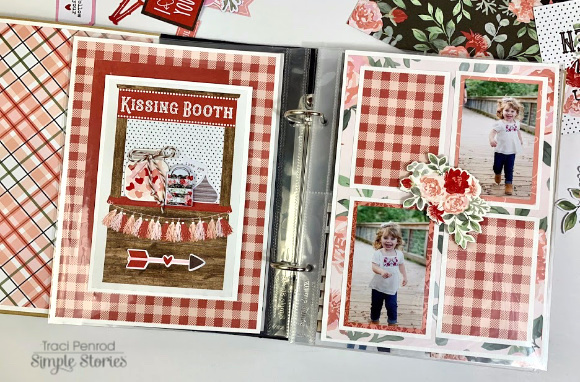 I’ve chosen to use the delightful Kissing Booth Collection that Simple Stories have brought out as the ‘Valentines’ collection. Firstly, let’s scrap the whole ‘valentine’ theme!! The florals in this collection are far to beautiful to only be seen in February!! I want to use them all year round! ...if you fancy it too, then, keep reading!! I picked out my favourite sheets of paper from the 12x12 collection pack, grabbed my divider templates from Carpediemplanners essentials and got cutting! You need to cut out as many dividers you’d like to have for your planner and one extra for the dashboard (pretty front cover) When you cut them out, there’s no need to cut the tabs out for each one, leave them off. So, really, it’s like cutting out lots of dashboards...you still with me? Hearts! Yep, I know I said I was skipping the whole ‘valentines’ thing, but, this is my ‘heartsbyemma’ secret! You need to cut out or punch out twice as many hearts as you have dividers. I’ve done six dividers, so, punched out twelve hearts. Oh, and don’t forget to use your trusty Carpediemplanners A5 hole punch, every planner girl needs one! Using a punch makes this much quicker than handcutting each heart, but it’s not essential! I like to use, just an ordinary stick glue, as this gives you time to manoeuvre your hearts around into the perfect position! 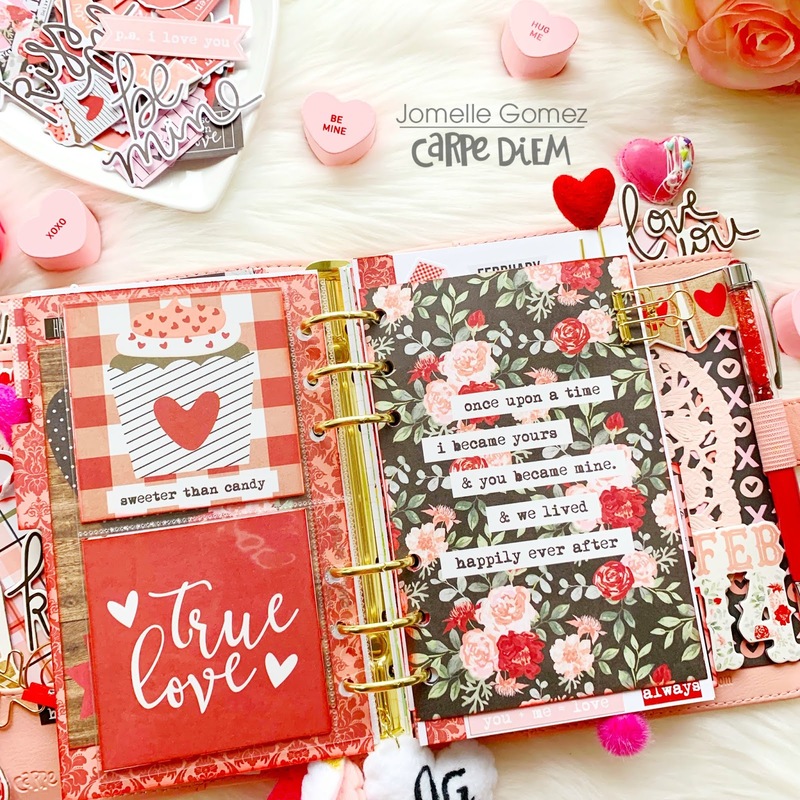 You want to evenly place the hearts as you would with your usual style tabs, depending on the number of dividers you have chosen, will depend on how big or small the gap is between each one. You’ll need a heart on both sides of the divider, this makes them look visually nicer, but also double the thickness, gives double the strength! You can see here how the finished result gives a wonderful scalloped effect! Now it’s time for the fun bit! Decorating!! I have to warn you, you’re going to be shocked when you see my ‘minimal’ decoration! I know, I know, Emma, Minimal?? You never thought you’d see that did you! Let me explain myself! I have chosen big, bold, in your face, florals! These florals are centre stage, they speak for themselves, why cover something up when it screams beauty, like these florals! I have interspersed the florals with polka dots & stripes, this is to break up the florals, making them stand out and shout even more. Here is where decoration can be added, but, you guessed it, I’ve gone minimal again! Using only images from the 12x12 cut apart sheets for decoration. You could just as easily cut out some pieces from the floral sheets if you prefer. To make the journaling cards ‘pop’ , I have simply drawn around the edge of each one with a black ink pen, and as daft as it sounds, it really makes a difference! 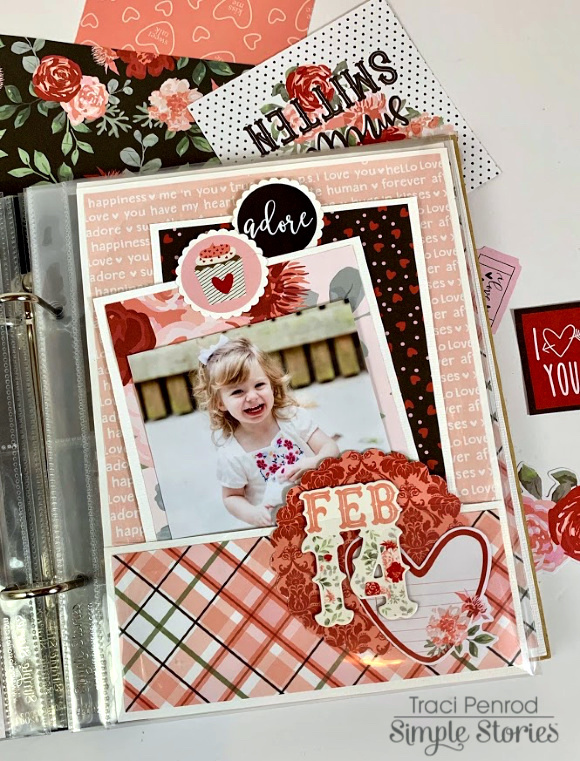 Nathalie with you today to celebrate the arrival of Winter (here in the Northern Hemisphere) with a colorful and fun layout using the beautiful Simple Stories new line Freezin' Season. Though, Toronto-Canada has yet to get some snow, i have so many memories of snowfalls past, and the colors in the collection were perfect to bring the fun of Winter to my scrapbook album. To start, a bit of white acrylic paint was added to the Hello Winter paper -this hazes the pattern in the background, while creating a whiter canvas for the layout-. While the paint dried, the"Winter" cut file (from Paige Evans) was cut from white cardstock, and backed with papers from the Freezin' Season collection. The cut out was placed on a slant on the background, so that it adds playfulness to the page. The picture was backed with papers from the collection ( the element pages are a great to layer and back pictures! ), and then it was nestled in between the background and the cut out. Since the picture shows my niece holding a snowball, i decided to continue the circle motive throughout the page. For this all the circle snowflake embellishments from the collection were used to create clusters around the picture, along with some die cuts and stickers. Love all the colors! To complete the title of the page, a cluster of snowflake embellishments was created at the top left corner of the cut out. Here the the "Freezin'" chipboard was added. In a similar manner the "Season" chipboard sticker was added at the opposite -diagonally- corner of the cut out, so that the title reads "Freezin' Winter Season". Those circle snowflakes were perfect to create clusters around the layout. Some were tucked under the cut out, while others are floating on the page along with sticker words and embellishments from the collection. Just a few lines of journal and some white ink were the final touches of this page. I hope this inspires you to check the colorful designs and colors of the Simple Stories' Freezin' Season collection. It is the perfect collection to document all those happy Winter memories. I hope you’re having a great day! 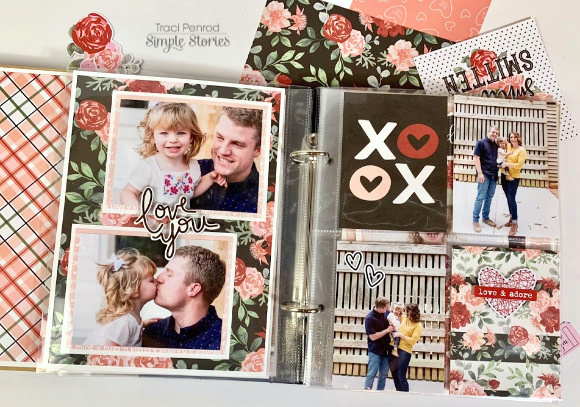 Today I’m sharing projects created with the Simple Stories Kissing Booth Collection. You’re going to ADORE this collection.. it’s got romantic dramatic florals, pretty plaids and polka dots, and flirty hearts and kisses! You'll find die cut Bits and Pieces, 6x12" Chipboard and stickers that make creating with the collection a breeze. I like to use the 3x4 journalling cards as a focal point for my cards. They’re quick and fun to embellish and the possibilities are endless! The Collection Kit includes a sticker sheet. I sprinkle them with powder to remove the adhesive backing and then add adhesive foam tape so I can add dimension to my creations. If I later decide I want to adhere them flat I use liquid adhesive. 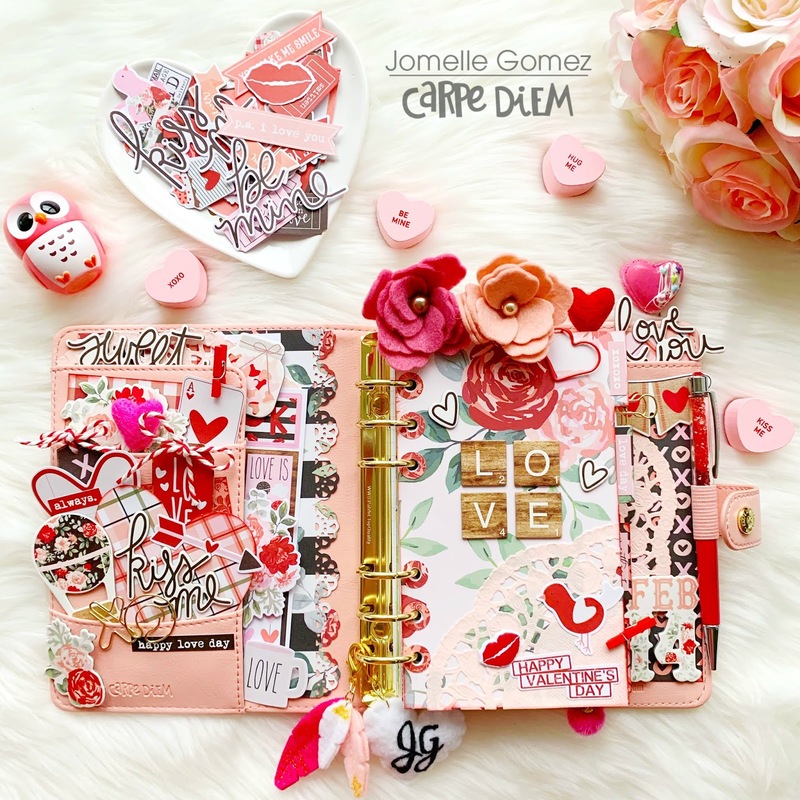 This collection is sure to make your Valentine’s Day cards, gifts, décor and page layouts a treat! Hello, Iris here with a layout that's all about embracing the Freezin' Season! This whimsical collection was perfect for documenting the first time we took my girls to play in the snow! I picked the dark, snowy Shiverin' paper as my background to provide great contrast. I wanted a design reminiscent of snowballs tumbling down, so I printed my photos at 2", 2.5", and 3", and punched them with circle punches of those sizes. Then I cut some Doodle Circles (Silhouette Store Design ID: 68077) from the Snuggle Up paper with my Cameo to frame them. I arranged them across the diagonal, varying placements and leaving space to intersperse some cute elements. The circles along the edges are cut off because that gives the design even more movement. For texture, I machine stitched several times around the frames. I added some of the die-cuts from the Bits & Pieces pack to fill in the gaps, including the snow globe to add some interest in the middle of all those photos. There's stitching around the globe as well. I placed word strips form the Combo Stickers and the 4x6 Sticker pack to caption each photo. I always delight in finding just the right little phrase to go with my photos. Chipboard snowflakes help bring the die-cuts and word strips together into clusters. The final piece was to add my title, which I propped up on foam, across a small gap between my photos and the journaling. For my journaling, I punched a circle out of one of the journaling cards from the 4x6 Horizontal Elements. See that cute penguin poking up from the bottom instead of another photo within the circle? He adds something a little unexpected. Freezin' Season is so stinkin cute, with fresh fun colors and icons that will make documenting all those chilly winter outings super fun! Hello, it is Kelly here today on the Carpe Diem blog. 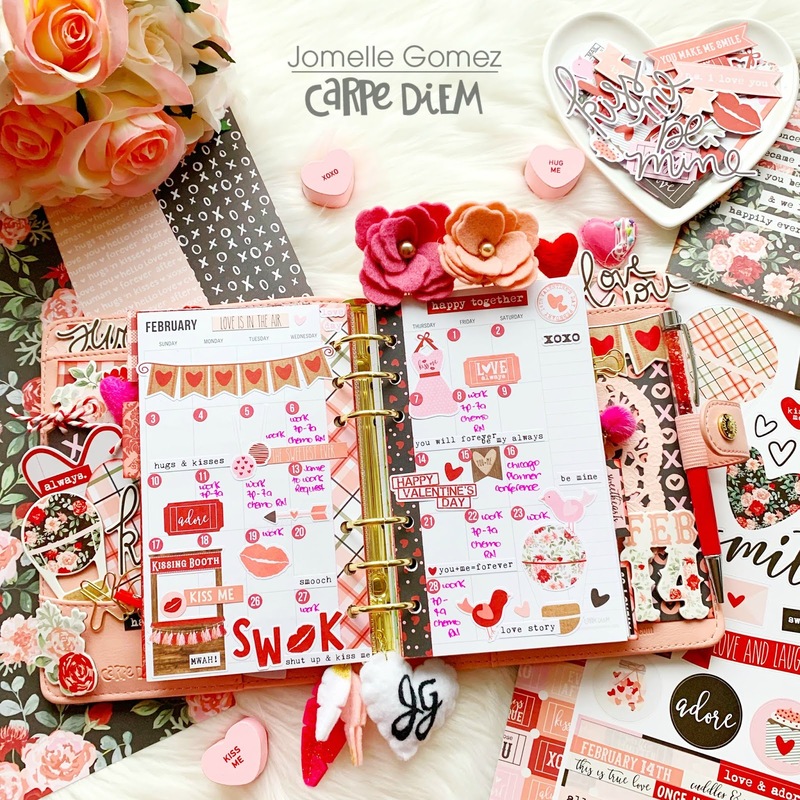 Last year I showed you how I have setup my Color Wash Carpe Diem planner for 2019 using the ‘Hello’ monthly inserts. In this blog I will show you how I have decorated my spreads for the winter. I first decorated the first week of the new year. This month, I am using vertical inserts and because I did not have very many appointments or to do’s I decided to decorate the whole page with some stickers and punched stars. I punched ‘2019’ from four different papers of the Freezin’ Season collection. I love how this spread turned out! Next, I used the Numbers sticker tablet to date the entire monthly spread with the yellow flag number stickers. I added some functional label stickers from the Basics sticker tablet and decorated the page with some stickers and washitape from the Freezin’ Season collection. For this month I already know I have a big to do list. Therefore, I created an extra 4x6 card: I used the 4x6 vertical elements paper and cut two 4x6 cards. I glued them together and used the planner punch to punch 5 holes. I used my scissor to cut some slits in the holes so I can easily take the card in and out. On the back side I stuck some little stars from the Basic sticker tablet to serve as bullet points for my to do list. Now I have to start writing everything down! I hope you enjoyed reading this blog, you can find more planner inspiration on my instagram. Have a great day!